Developed by New York’s Kimco Realty and located at Interstate 459 and Alabama 150, tenants of this $100 million shopping center include Kohl’s, SuperTarget, Petco, Compass Bank and Cadence Bank. When it opened in October 2009, its 380,000 square foot SuperTarget store was the largest of its kind in the United States. Dunn Construction Company served as a subcontractor on The Grove’s $ 3 Million, 125 acre paving project. Dunn installed the stone base and asphalt for the project—which included parking lots and roadways. 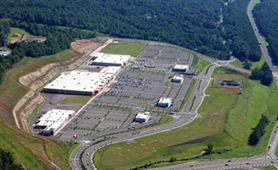 Dunn also installed over 77,000 tons of dense graded base and 34,000 tons of asphalt. The civil portion of this project alone involved the moving of 2.5 million yards of earth and rock. Dunn Construction closely coordinated its work with the general contractors, Saiia Construction, to ensure that the project would meet the scheduled opening date of October 2009. The SuperTarget store’s unique standards posed a particular ongoing challenge during the project. On several occasions, Dunn deployed multiple crews to meet the scheduled deadline. The company’s efforts on this project earned Dunn the Alabama Asphalt Paving Association’s Quality Pavement Award for Parking Lots and Commercial Facilities Category in 2009.